Home Latest News Justin and Vitalik – love and peace or battle intensified? Justin and Vitalik – love and peace or battle intensified? 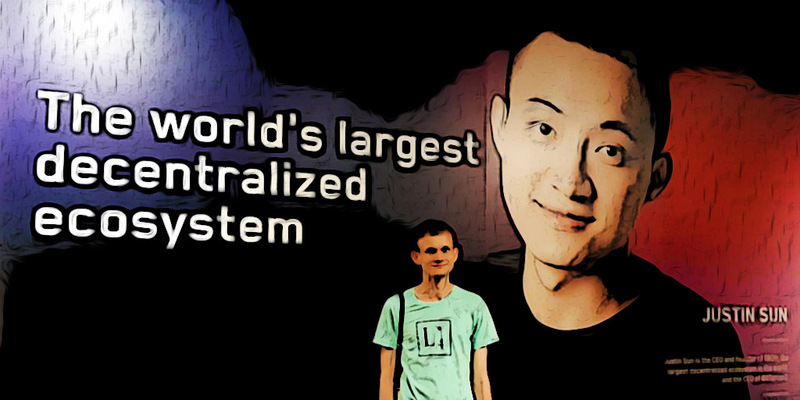 On April 1, 2019, Ethereum founder Vitalik Buterin posted a tweet of a photo of himself along with a large exhibition board featuring Justin Sun in the background. The photo was taken during Token2049 crypto summit which took place in Hong Kong on March 14. Vitalik also commented “Toward a brighter tomorrow” on that tweet. As Vitalik’s tweet was made on April Fool’s Day, which was also pinned to the top of his Twitter’s timeline, it is clear that this is an April Fool’s joke as the two didn’t get along well in the past. This was not the first time Vitalik took the initiative to attack. The battle between the founder of the TRON and the founder of Ethereum intensified. Subsequently, Justin retweeted Vitalik’s tweet and replied with a simple comment “Love you <3”. In fact, this was not the first time that the two had this kind of interaction in public. Back on April 6, 2018, Justin made a tweet summarizing seven reasons why TRON is better than Ethereum, i.e. 10,000 TPS, zero handling fee, Java language, etc. Vitalik promptly replied “8. Better white paper writing capability (Ctrl+C + Ctrl+V much higher efficiency than keyboard typing new content)” on that tweet, suggesting that TRON’s whitepaper has content that was copied from other sources. As time goes on, dApp development became more prominent. Ethereum, EOS, and TRON also secured their spots and became the three most popular blockchains with the most dApps. Realizing the importance of dApp development, Justin had made numerous attempts to recruit talented developers around the world to join TRON. This eventually led to the famous “avocado incident” between Justin and Vitalik. The story begins with an interview of VICE on HBO with Vitalik back in 2017 when Vitalik praised the BitTorrent’s decentralized sharing network. A musician which is known as CryptoBeats on Twitter quoted the interview and applauded BitTorrent (which is acquired by TRON) as the perfect vehicle for TRON to increase mass adoption & scalability for dApps. In response, Vitalik emphasized that the interview was conducted back in August 2017 and the acquisition of BitTorrent was in July 2018, therefore, his praise for BitTorrent had nothing to do with TRON. Justin responded back to Vitalik stating if he acquired all avocado farms, Vitalik will have to listen to him. However, he is happy to give Vitalik avocados for free. This is suggesting that if TRON is able to dominate the dApps market in the future, Justin will still open his arm wide and welcome Vitalik abroad. We all love avocados. I acquired all avocado farms and reached to monopoly. Now if you still love avocados you have to listen to me. However, I am happy to give you free avocados for sure! TRON has achieved decentralized and autonomous community, with 27 super representatives and more than 100 super representatives candidates securing the TRON network for more than 260 days. In the past 14 days, the daily transfer on TRON network has exceeded 1.8 million, which is 3.3 times the average daily transfer on the Ethereum network. TRON has more than 2 million users, which is 2.6 times the number of EOS users. There are more than 6,000 smart contracts running on TRON network, and the number of contract calls exceeds 14 million. According to DAPP Radar, there are 172 TRON based dApps recorded. DAPP Review indicates that the number of dApps on TRON network reaches 242. According to DAPP Review, from March 4th to March 8th, the total amount of dApp daily transactions on TRON network has exceeded the dApp daily transactions running on Ethereum and EOS combined. These are clear indications that TRON has made positive progress and surpassed Ethereum and EOS in many aspects. Continuing the story, Vitalik accepted an interview with Unchained podcast on March 28, 2019. During the hour-long interview, Vitalik admitted that to some extent, Ethereum did lose its leading position. However, he did not forget to mock TRON by saying if TRON was to replace the position of Ethereum, he will lose hope for mankind. Justin promptly counter attack by stating when TRON succeed, they will build a monument in the memory of Ethereum. Vitalik will also be remembered for his tremendous contribution in the blockchain industry. The battle of the two founders has yet reached a solid conclusion and it looks like the battle may carry on in the near future. TronLive hopes that these competitions will spur the invention of better technologies and introduce more efficient and effective blockchain use cases for the benefit of humanity!